Flower painting is the elegant thread that connects the stories of nine extraordinary women – diverse in background but all artists. Some were New Zealand-born, but most came from across the seas; new immigrants unlikely ever to return ‘Home’. 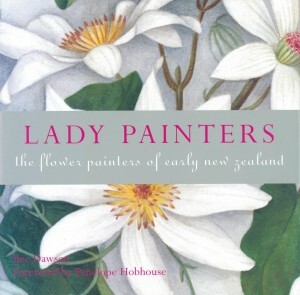 In the raw colony of New Zealand these lady painters took great solace in their art. Some painted to support themselves or their families, others largely for pleasure; all were fascinated and stimulated by the beautiful, strange flora of this new land. Their stories span a full century, beginning soon after the signing of the Treaty of Waitangi. They cover years of exciting botanical discovery; years of war and hardship; and years of colonial solidarity. In Lady Painters author Bee Dawson has captured the spirit of an era with a brilliant text full of lively and amusing accounts of daily life that feature an assortment of colourful characters. Beautifully illustrated with original paintings from each artist, this is a book to delight and treasure.